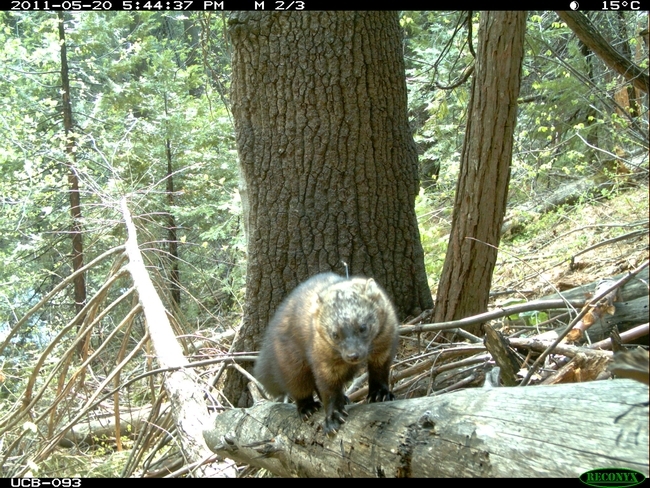 The UC Berkeley Sierra Nevada Adaptive Management Project (SNAMP) Fisher Team has just finished closely monitoring reproductive-age female Pacific fishers living in the Sierra National Forest near Bass Lake for the spring 2011 denning season. Each year the denning season for fishers starts around late March and ends in mid June. Female fisher F01 about to squeeze into the opening for a den cavity inside a black oak tree. The cavity opening is about 25 feet up the tree. 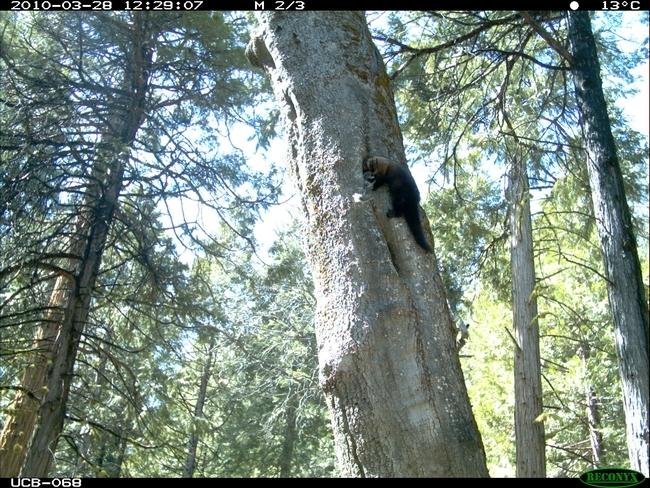 The fact that one of the study's radio-collared female fishers moved her kit from a natal den tree (where the kits were born) in the Sierra National Forest to a maternal den tree in the Mariposa Grove area of Yosemite National Park was a highlight. The event was significant for the park service because it represents the first known fisher den tree location in Yosemite National Park. The National Park Service produced a news release detailing the story. The Fisher Team also hosted a visit to the project area by a reporter and photographer from the Fresno Bee, which resulted in positive coverage in that newspaper and in the Sacramento Bee. Below are images captured by den tree cameras this spring. The images illustrate the types of photographic evidence the SNAMP Fisher Science Team uses to document natal and maternal den trees being used by fishers. Fisher leaving a den tree (the oak in the background) to forage. Fisher climbing down her maternal den tree. One of the projects key goals during the denning season is to estimate the typical number of kits that adult females produce each year. 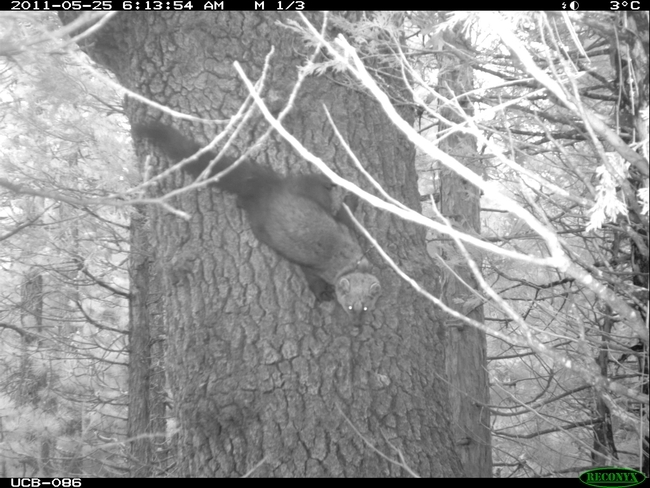 One way to do this is by climbing the den tree while the mother fisher is out foraging, and then lowering a specialized camera down into the den cavity. Below is an edited portion of the video footage recorded from inside the den cavity of female fisher F07. The one-minute clip shows two fully furred fisher kits snuggled up together inside the F07 den tree cavity. Unfortunately, the 2011 denning season was not without life/death drama for the population. Last year two denning females were killed, leaving five orphan kits behind. The Fisher Team rescued and later released the orphan kits into the wild. 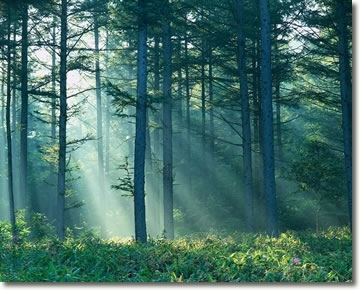 This year it was looking like there would not be any denning females killed during den season, up until Saturday, June 4, just two weeks before the typical end of den tree use. On that day the researchers found the predator-killed carcass of adult female F28 about 150 yards from her den tree. After last year's orphan rescue, the California Department of Fish and Game (DFG) worked with a group of wildlife researchers (including the SNAMP Fisher Team) and agency stakeholders to develop an official policy to help guide researchers on how to deal with orphan kit situations. In keeping with this new policy, the SNAMP Fisher Team carefully considered the characteristics of the den tree structure (a rotting white fir snag), consulted with DFG, and reached the difficult decision not to attempt to rescue the one or two orphan fishers in the den tree. Attempting to climb the tree would have been dangerous and overly risky for the SNAMP Fisher Team crew. Therefore, in this specific case, nature was left to take its course; F28’s fisher kits perished in a den cavity somewhere near the top of the white fir snag. The SNAMP Fisher Team is currently preparing information on a wide variety of preliminary results and findings from the ongoing research, which will be reviewed during the SNAMP Fisher IT Meeting in Fresno on July 19. 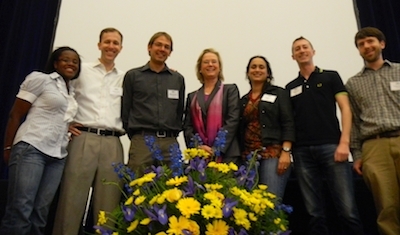 More analytical details from the spring 2011 denning season will be presented at that venue. 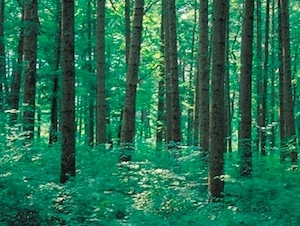 The SNAMP Fisher Study is funded by the USDA Forest Service. The agency also provides an airplane and full-time pilot to assist in locating radio-collared fishers living in remote parts of the forest. 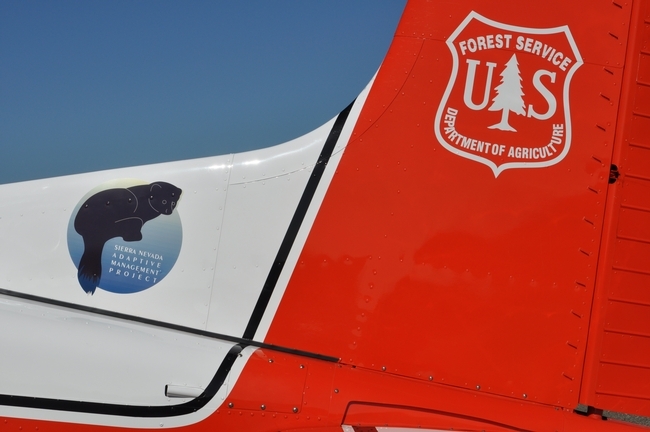 The image below is a logo for the SNAMP Fisher Project affixed to the tail section of the Cessna 185 airplane used to track fishers by aerial radiotelemetry. We're in the midst of a housing crisis, so why not build a 30-unit, high-rise condo in your yard? 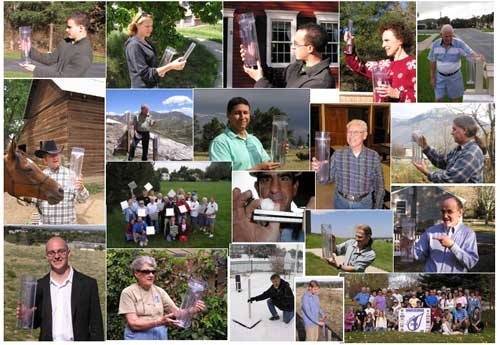 No, not for people--for native bees. We just installed a bee condo for leafcutting bees (Megachile spp. ), on a five-foot high pole overlooking catmint, lavender and salvia. 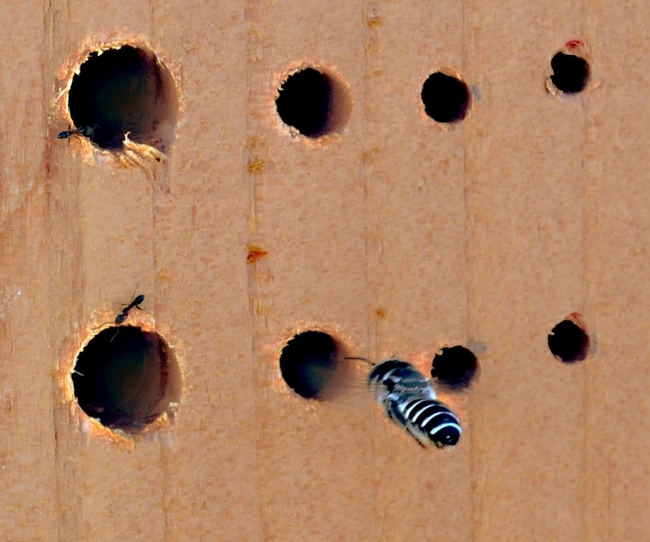 The "housing development" is actually a wooden board drilled with small holes to accommodate our tiny tenants. Comfy and convenient. Rooms with a view. No housing permits or EIR required. Rent-free, mortgage-free. Leafcutting bees, aka leafcutter bees, are about the size of a honey bee but darker, with the characteristic light-banded abdomens. They are important pollinators. Why are they called leafcutter bees? Because the females cut leaf fragments to construct their nests to raise their brood. In nature, they build their nests in soft, rotted wood or in the pithy stems of such plants as roses, raspberries, sumac and elderberry. Unlike honey bees, which are social, the leafcutting bee is a solitary nesting bee. She provisions her leaf-lined nest with nectar and pollen, lays an egg, and seals the cell before leaving. Commercially made bee condos are available at beekeeping supply stores or on the Internet. 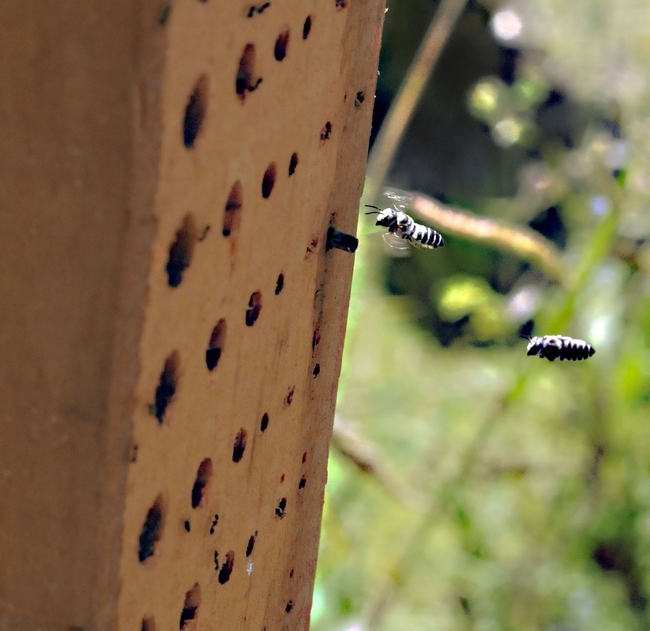 You can make or buy a board with different sized-holes so other native bees, such as blue orchard bees, aka mason bees, receive a "home, sweet home," too, and deliver pollinator services. And enable you to tell your family and friends that you're a "bee landlord" or beekeeper. The Xerces Society for Invertebrate Conservation offers tips on building bee condos on its website and in its publications, including Farming for Bees: Guidelines for Providing Native Bee Habitat on Farms. If you don't want bee boards housing your tenants, you can provide straws or hollow bamboo stems. At the UC Davis Department of Entomology, doctoral candidate Emily Bzdyk is doing research on leafcutter bees. "Basically I'm doing a revision of the subgenus Litomegachile, part of the large genus Megachile, which includes leafcutter and resin bees," she said. "They are native to North America. My goals are to find out how many and what the species are in Litomegachile, and find out as much as I can about their biology, or how they make a living." "I also want to identify clearly what the boundaries between the species are, or how to tell them apart from one another," said Bzdyk, whose major professor is Lynn Kimsey, director of the Bohart Museum of Entomology. "Litomegachile are very common and hard-to-identify to species, and I feel they deserve attention." Bzdyk noted that some Megachile are used in commercial alfalfa production. 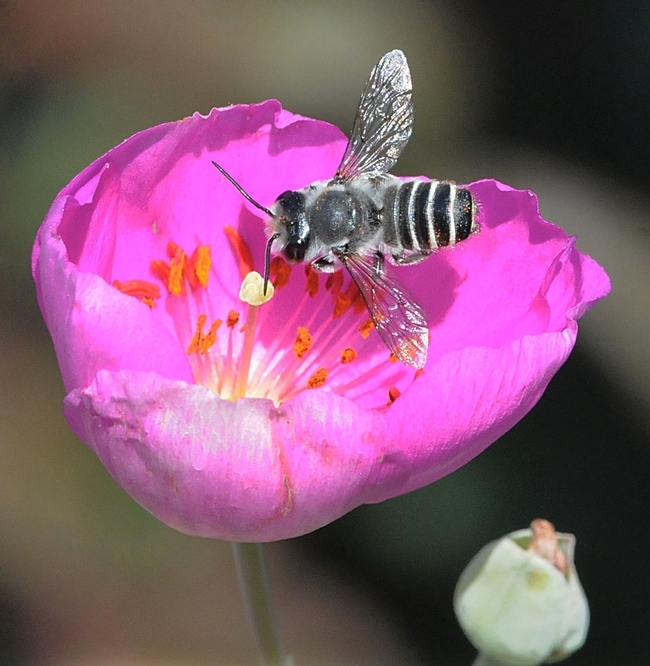 The alfalfa leafcutter bee, native to Europe, is used for commercial pollination of alfalfa, she said. "The Litomegachile is probably very closely related." The alfalfa growers erect giant bee condos in their fields to draw bees to their plants. With home gardeners, the effect is the same. If you build them, they will come.